The Cruze’s standard turbo engine gets EPA-estimated 40 MPG highway, and the diesel option gets a stunning 47 MPG highway. Harness all the technology you need inside the Chevy Cruze interior with available built-in 4G LTE Wi-Fi and wireless charging capabilities. Standard projector-beam headlamps with LED signature touches, along with LED daytime running lamps distinguish the Cruze and give it a major cool factor. 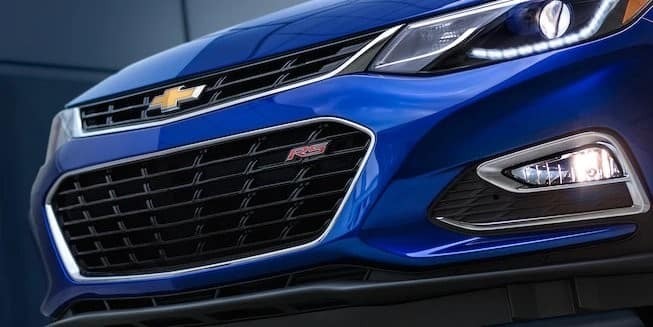 Born for fun in a hatch or sedan style, Chevy Cruze trim levels give Carol Stream and Bloomingdale drivers a wide range of features to choose from. Choose from the LT, Premier, and Diesel hatch trims, with either manual or automatic transmissions, and five sedan trims – L, LS, LT, Premier, and Diesel, with manual and automatic options. With all the technology and audio system options, plus available amenities like leather seating, BOSE® premium sound, and remote start, the Cruze is in the perfect position of the no-brainer choice, especially when you consider its starting price of $16,975. Read more about Chevy Cruze technology.